VISITORS – You are responsible for your visitors. All visitors must report to the office, pay a small fee and all visitors must check out by 10pm, or purchase an overnight pass. BEACH/RIVER – Our beaches are not supervised and children are YOUR responsibility. The river is deep and flows fast at certain times of the year. Please watch your children continuously while near the water. We recommend life jackets for anyone who is not a strong swimmer. QUIET HOURS – Quiet hours are from 12pm-9am. All radios and bright lights should be off; there should be no loud talking during these hours. Report disturbances to the office. No loud music at anytime. CHECK IN TIME – campsite are 1:00pm and cabins are 4pm. CHILDREN – Children are encouraged to have fun here. However, they must be respectful of other campers and not be overly loud. No one is permitted to cut through other campsites. Rules of the road apply to bikes and children must wear helmets at all times as per Ontario law. Proper lighting is also mandatory after dusk. Children are permitted to use small battery-operated ride on toys, on the roads but must yield to all other traffic. Children and teens should be at their site or with an adult by 10pm. WATER USEAGE – No washing of cars/trailers/ATVs on park premises. No washing of dishes in the bathroom and shower rooms. 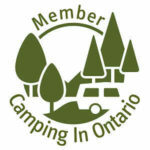 PETS – Pets are welcome at our campground however all pets MUST be kept on a leash at ALL times and be cleaned up after. Pets are NOT allowed at the beaches. They may swim at the boat launch areas. Pets are not permitted in ANY of the rentals. CAMP FIRES – Firewood can be purchased in the office. Do not move your campfire pit. Douse your fire during periods of high wind or when retiring for the night. No outside firewood allowed. Do not leave any garbage in the campfire pit. CLOTHESLINES – Clothes lines are permitted at your campsite so long as trees are not damaged. OFFICE AREA – The office area can be busy, please keep the driveway clear as much as possible. SPEED LIMIT – The speed is 10km/hr in the park. PLEASE DRIVE SLOWLY AT ALL TIMES! If you are reported speeding through out the park, you will either be asked to leave or park your car near the office for the rest of your stay. VEHICLES – Please park your vehicle on your campsite only. Visitors who do not fit on your site are required to park in visitor parking. REFUND POLICY – There are NO REFUNDS after arrival. See cabin/campsite cancellation policies. GENERATORS – Use of generators are NOT permitted in the park. ATV/UTVS’s – Riding around the park is not permitted but you may ride to and from the trails. BOAT TRAILERS – To be stored in designated areas only. NON CAMPER DAY PASS- Non campers are permitted to purchase a Day Pass for $5 plus tax per person. Please stop at the office to register and pay, as well as sign out before the office closes. Passes will not be permitted on long weekends or any special events. Anyone not following all the rules will be asked to leave immediately without refund. We ask that non campers leave their pets at home since we do not allow pets on the beaches. SMOKING – Is not permitted within 25’ of the beach, office and other campground buildings. Smoking is also not permitted within 50’ of the playground. This includes vapes. You are responsible for taking reasonable precautions to prevent second hand smoke from bothering other campers throughout the park and on your site. NO smoking anything in the cabins at anytime. Thank you for your cooperation! These rules help make everyone’s stay more enjoyable.